Mantagon vs. Mantapus! Next Week On SyFy! Welcome to the third installment of my walkthrough of the third volume of the “All The World’s Monsters” series of quasi-D&D supplements from the late 70s/early 80s, when disco was dying and CB radios were the new Internet. Part I of the Third Part is here, and Part II of the Third Part is here, and the party of the second part is telling Judge Judy that she didn’t do it because no one saw her do it since she looked around before she did it and didn’t see anyone. Yeah, that happened. The image to the left (or maybe top, right, or bottom depending on how this renders on your device) is not a lavoid, though it kind of looks like what someone would draw if told “draw a lavoid”. Wait, what’s a lavoid, you inquire? Lavoid: A summoned creature that appears as moving rock, 9-12 feet high and 5-6 feet across. Or, you know, not a humanoid. When it attacks, it goes molten, doubling its speed and dexterity… which gives it a Dex of 30(! ), or significantly higher in AD&D terms of the era than the greatest of greater gods. Go figure. Also, the lavoid “preceedes” (sic) the arrival of a light demon. This is good to know. Lightning Mound: A blob with a single tentacle that does lightning damage. Once it hits a victim, it does not let go until the target is dead. Since there were no real rules for grappling/breaking a grapple, a simple declaration of “No, it doesn’t let you go” was considered sufficient. Player: I have some extra potstickers. GM: …OK, you can make a Strength check to break free. Lion: Just a lion. Not a flying lion (though there was a leopard, flying, that I skipped over), or a lion-unicorn hybrid, or an eight-legged lion with a scorpion tail except the tail is coming out of its forehead and it’s immune to acid and charm for some reason. Nope, just a lion. Get in the car. This is lion country. Manadon: A cross between a white dragon and a giant snake. Not to be confused with the…. Mantigon: A cross between a manticore and a blue dragon. Damn, dragons be gettin’ busy, yo! (Or is the proper spelling biz-zay?) Anyway, a blue dragon that shoots 4 spikes/turn that each do 1-10 plus “slow”, in addition to all the normal dragon stuff, is a pretty nasty variant and the name is decent, too. A++. Would kill players with again. Morq: I made all the obvious jokes… er, the one obvious joke… when I covered this in one of my Arduin articles. Mosquito: An actual, normal, mosquito. There were no standard “swarm” rules back then, so you had to attack all of the 100d10 of them one-by-one. (Unless you had a fireball.) There’s a 1% chance of getting malaria, per mosquito. This is what the DM uses when he has a four hour game scheduled and nothing prepped. Or when the players don’t give him any potstickers. Muncher: I am not sure, but I think this is a Pac-Man joke. 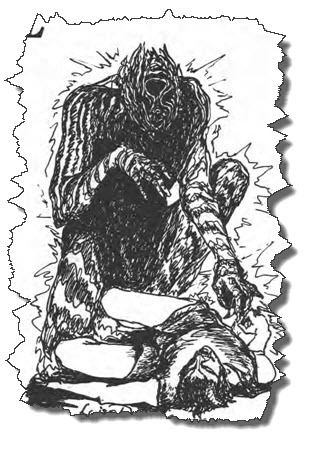 Nagedua: A 17 HD gorilla with two tendrils coming out of its face, and paralyzing claws. Anyone hit by the tendrils “lose[s] all his hit points” for 2d4 days. Erm, so, they’re dead? No, they’re only paralyzed (Note: This is in addition to the paralyzing claws). Meanwhile, the Nagedua gains all the hit points the victim lost. Given that it starts with 17HD – remember, red dragons in the era only had 11 HD – this is pretty, uhm, impressive. Nasnas: A panther-like creature at war with all dragons, especially chaotic ones. (This seems to hearken back to the very early Moorcockian alignment system.) Its breath can resurrect and ‘dispel all forms of dragon breath’, which is pretty vague. Does that mean it heals the damage done by dragon breath, regardless of type? (In general, D&D damage, once taken, is typeless. You may take half damage from fire, but whatever damage gets through is just hit point loss. A rare few mechanics, such as regeneration, sometimes require you to track which points are from which source, but those are rare and as we programmer types say, “deprecated”.) Or does it mean that if a dragon breathes, a nasnas can “counterbreath”, like counterspell, only, with breath? Oh well, there’s no need for detailed rules. Reasonable people always agree on what things mean, and, as well know, all gamers are perfectly well adjusted and inherently reasonable. It’s not like the hobby tends to attract people with underdeveloped social skills and exaggerated senses of their own intelligence and infallibility, or anything. I got the impression the Dexterity scores were used for initiative… but I’ve been wrong before.